How can one treatment help such a wide range of special need problems? Ok so this is the difficulty…..how can Brainchild help so many different types of special needs? ‘Surely I should be using a treatment specific to my son’s autism?’ I asked myself that question all that time ago when I first met Viv. So to put it simply, it is because many of the behaviours associated with our children’s problems stem from a developmental starting point. For many reasons a stage in the brains development has been missed, interrupted or skipped completely. Brainchild helps to address that particular area of development. Autism diagnosis depends upon a huge checklist of difficulties. That is why when it was suggested J had autism I found every reason to convince myself that it was wrong. When I looked at a checklist it was obvious he was not a savant or a hand flapper or in his own world ….come on ….he seemed to smile and laugh….. I was lucky as a fantastic nursery assistant had spotted behaviours and alerted me to the problems that were happening for my son aged 2. The process was long and no help was available. I took the bull by the horns and booked a paediatricians appointment. The LEA Nursery that my son attended followed up and began assessments from the whole gamut of professionals that are involved in the diagnosis process. Finally I came across Brainchild by accident through word of mouth and a few chance meetings. I now understand that each area of difficulty related to a particular development that my son had missed or not moved into. The program addressed each of these in a logical sequence. Now I am going through a huge transition stage with my son as he has just started mainstream secondary school. 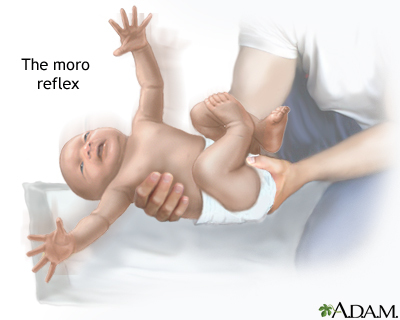 I recognise that many of his behaviours can be linked to his Moro reflex so I need to work on that with him now. The Moro seems to be one that can be affected by stress and trauma. Funny that it has also been a stressful time for me too – perhaps I should do some work on my own Moro! It is great that I have been given the tools to help my son once again – now I just have to work out how to do it with an older child that is trying to be less dependent on me! Teenagers!